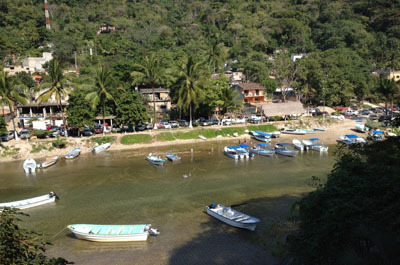 We just completed a week long workshop/vacation at the Casa de Los Artistas, ten miles south of Puerto Vallarta in Mexico. 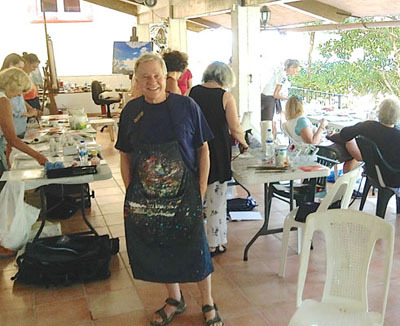 Nineteen painters from the USA, Canada and Mexico painted daily, starting out on our shaded open air studio patio, overlooking below the lively fishing village and the deep azure sea just beyond the lagoon. The sounds and ambiance of music and roosters celebrated each day while we painted in the comfort and hospitality of our generous hosts, Robert Masla and Monica Levine, at their private home and studio. 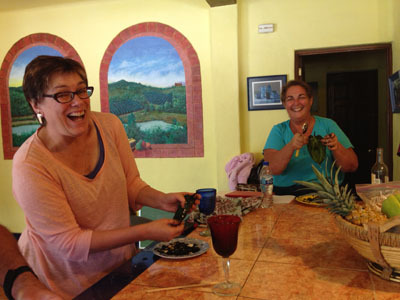 This was my first visit at La Casa following an impressive list of workshop instructors who return often. The students said it best - "Worth every penny" "Relaxing, painting and shopping!" "Authentic Mexican cooking - made with love and served daily (delicious!)" "Salsa lessons and candle light dinners on the beach" "Lots of painting time and demos." 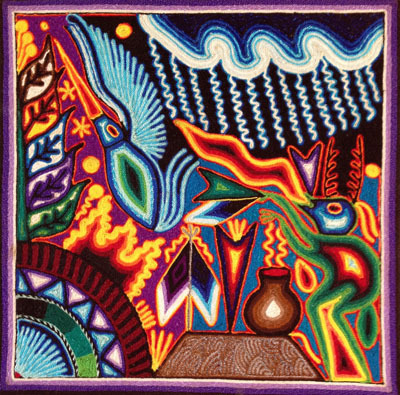 A side note: I'm not a world shopper- but on our afternoon shopping spree, I purchased an authentic shaman-made, mystical thread painting of a hummingbird, surrounded by the symbol for rain. As soon as we arrived home in draught-ridden California, yep, it rained - It worked! Just sayin'. So if you enjoy modern, Mexican creature comforts, painting and a little adventure, sign up for one of their famous workshops! 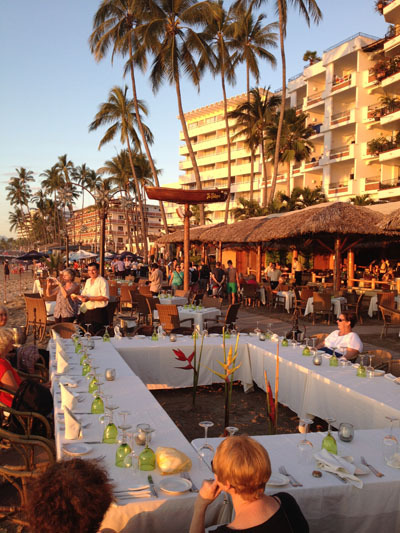 www.artworkshopvacations.com We are returning to teach another workshop, January 2016. 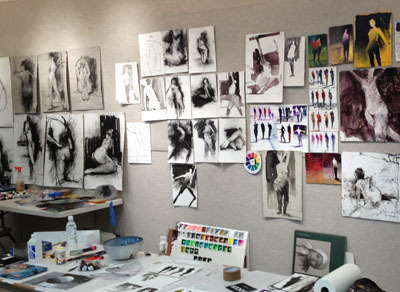 Lots of Figure Workshops coming up! 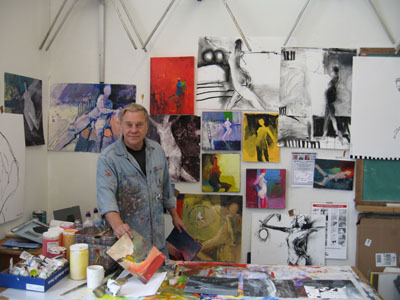 About these workshops - Contemporary Abstract Figure & Collage is all about drawing and painting the contemporary figure. 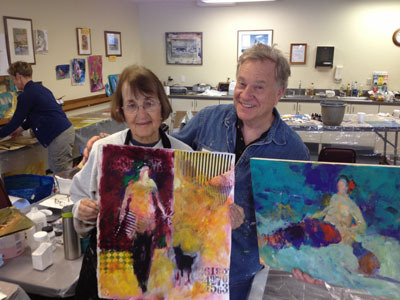 If you ever wanted to learn how to paint the freestyle abstract figure, this workshop is for you! 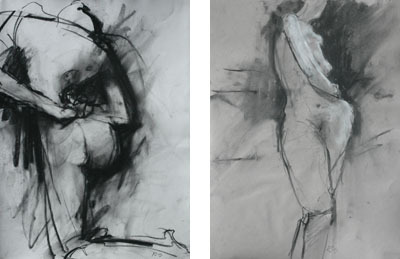 Variety of poses, lots of paint sketching and gestural painting. Be prepared to paint looser, bolder, freer, lighter and more intuitively. Your "drawing skills" are not a prerequisite. This class is fun for everyone! Clck here for more info. Artists have been making their marks forever. Lascaux cave drawings using burn sticks, stones and dirt. 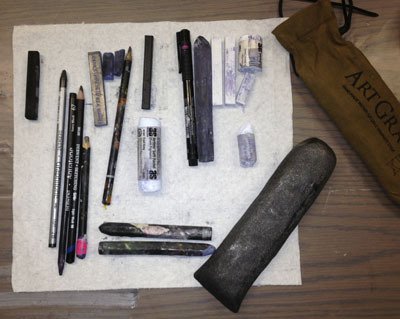 Today's drawing tools are varied and more available than ever. I've experimented with most and have settled down with a few of my favorites. 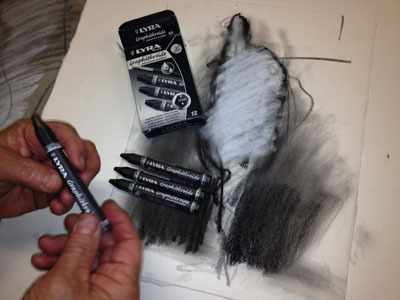 •Charcoal - soft (not compressed) They are available as 1/4" willow sticks, Jumbo 1" stubs, square blocks and even charcoal powder. 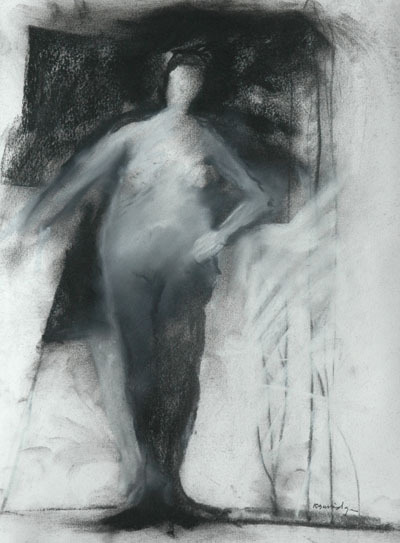 I have been using General Pencil and Soho Charcoal & Sketch Squares. •Conte Color blocks - brick red is my favorite! •Pencils - Water soluble. Derwent Graphitone 8B (black) continues to be my favorite. Also Derwent Inktense Pencils & Blocks. Draw as a pencil and wet brush later or dip in water and draw - or draw on wet paper. All have slightly different effects.Permanent when dried. •Lyra Graphite Crayons - soft drawing crayons. Comes in water soluble and non-water soluble. •Drawing Inks - Should be acrylic based - acrylic fluid brands, such as Liquitex Professional Acrylic Ink and Holbein Drawing Inks. •BFK Rives Drawing Paper - Mould made in France with a smooth absorbent surface, this 100% acid-free, soft paper is a good surface for my soft charcoal drawings. 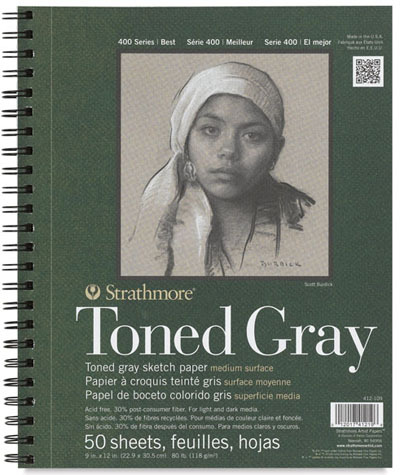 •Strathmore 400 series, Recycled Toned Gray Sketch Pads - This warm gray paper is great for darks and light color pastel. The mid tone is already there. 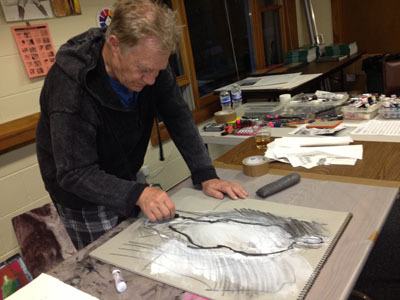 Whatever you choose from the above list, be certain when dried, the drawing is permanent and doesn't lift when re-wet. This feature allows me to paint on top with transparent dyes and paint without dissolving the drawing underneath. 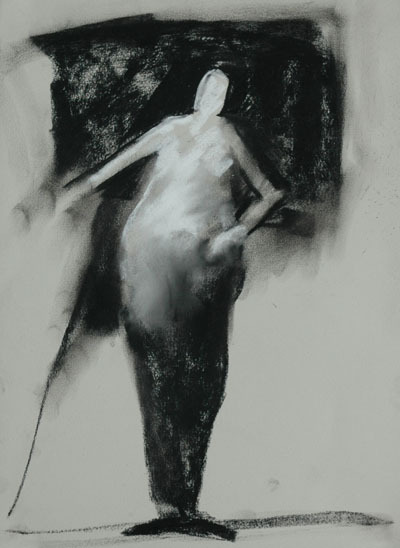 Using soft black charcoal on a toned gray sketch pad, I begin at the top with black shapes to reveal the head and torso- Negative shape drawing. 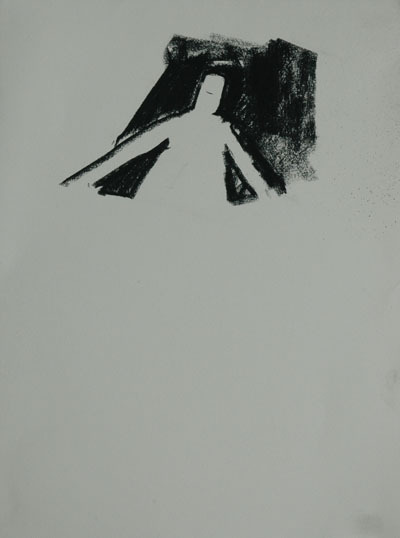 I continue now on the bottom half of the figure - the Positive shapes. This is what I refer to as "Rembrandt Lighting", the emphasis being the portrait and the torso. At this point, soften the edges you want to disappear and fade away. Keep the figure in sharp focus. The background mid tone gray of the paper, plus the darkest black of the charcoal is now ready for the white pastel highlights. The final sketch should have an overall cohesiveness of darks against lights, hard and soft edges, and an emphasis on the torso and head. Of all the drawing books you and I own (the ones we don't look at anymore), this book could be our final and, dare I say, the best I have seen. 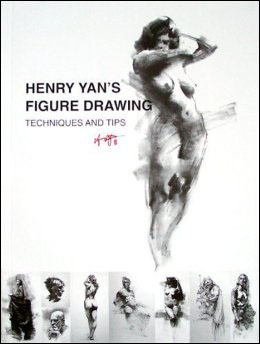 Henry Yan's Figure Drawing, Techniques and Tips. 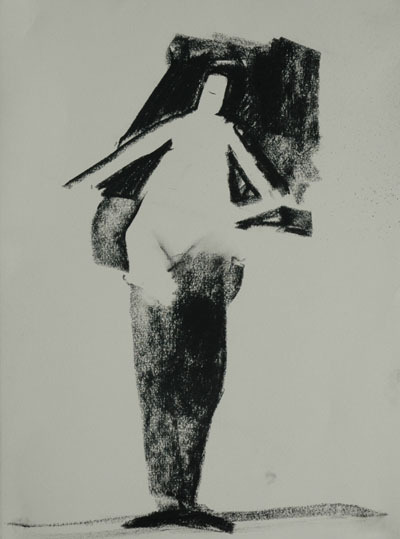 The drawings, created in the teaching studios of the Academy of Art University in San Francisco are all charcoal pencil, compressed charcoal and vine charcoal on toned paper. Wow, this guy can draw! Rich, powerful, black and white studies and longer poses fill every page. Mr. Yan's confidence and influential images are a result of twenty years teaching at the Academy. You need to see his drawings. Get this book! Click here here for information and ordering! 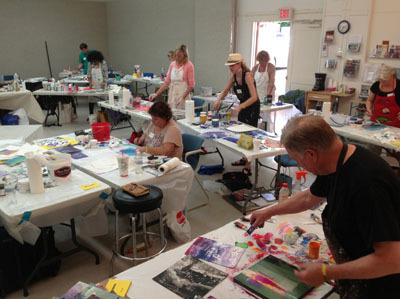 We have Art Marketing Workshops Coming Up! We are always updating and reworking our website! With all the new connected sites, social media and blogs out there - you still do need a website. Think of it as your storefront. Here are some tips that we have discovered along the way that has certainly helped us stay focused. 1. A domain name that incorporates your brand - your NAME. Make it easy for people to find you. Assignment - google yourself. Check to see if your domain name is available. You can use godaddy.com to search. 2. Clean and consistent design - No music, lights to turn on, clever footprints etc. Has to be fast or people loose interest and move on. No Flash! 3. EASY to navigate. Should be easy and obvious with navigation links on every page. 4. Contact info on every page. 5. An email list that automatically manages subscriptions - we use Constant Contact. 6. To show your artwork, don't overwhelm with lots of random images. Divide into "portfolios" or "galleries" and label them on your website. 7. If you have a link or your customers to click on - have that link open in a separate page. Do not toss your customers off your site! Don't forget links to social media. 9. Current - current - current! 10. Optimize your website for all the different devices: phone, tablet etc. 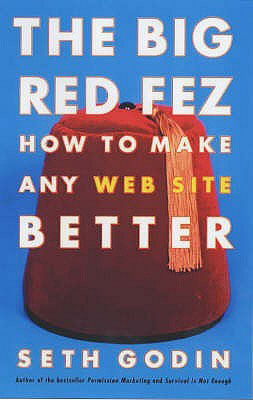 Here's an older book by Seth Godin about websites. The info in the book is still very viable and current. It's a small book too and easy to read! 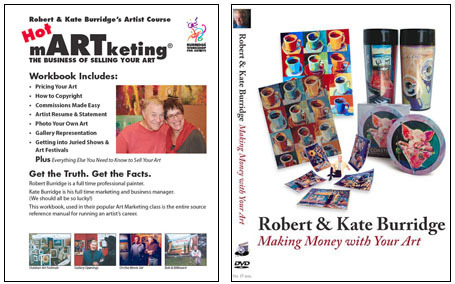 Check out our Art Marketing Workbook and DVD! Click here for details for Hot Art Marketing Workbook. 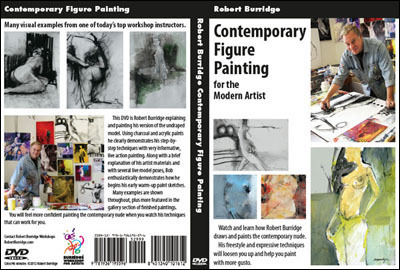 Click here for details for Making Money with your Art DVD. 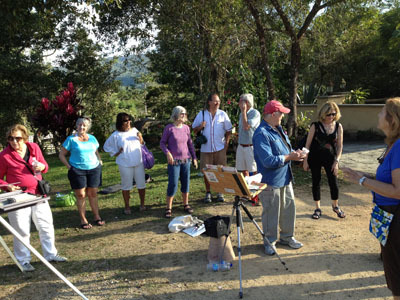 The photo below was taken at our workshop at Casa de los Artistas. It was during a cooking lesson! We mainly drank wine, took photos and watched in awe! We assisted with chile-prep for a delicious recipe "Chiles en Nogada" and even made corn tortillas. Yum yum! Kate your Art Marketing Girl!